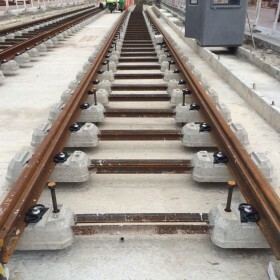 System W 25 was developed for tramways that use grouted biblock sleepers. One of the main advantages of this technology is the capability of being completely preassembled in the factory. Due to the diagonal shoulder adjacent to the rail seat, wedge guide plates can be used to regulate the gauge in defined steps, without the need of dismantling the components.